Blended families often include challenges that get dumped on the children. Just 50 years ago, there were far fewer divorces and the term blended family was decades away from being invented. Today, however, the percentage of families that are blended — defined as children living in a household who share one or no parents — is on the rise. The numbers have affected my family, too. As a result, we've had to learn to be sensitive to the unique needs of our step-grandchildren. Blended families often include challenges that get dumped on the children. On top of what is a messy experience of separation and divorce, children may have to contend with joint custody and separation from their home, family and friends, while being introduced to new ones. Moreover, the kids have to cope with the changes, regardless of whether they like it or are emotionally prepared. It may be upsetting to you, too, so imagine what might be swirling through the minds and emotions of your step-grandchildren. There may also be challenges with family leadership. Conflict may arise when parents need to coordinate their efforts and interact with each other's children. Invariably, guidance and discipline create other complications. "I don't have to mind you; you're not my dad" might be one declaration that echoes through a blended-family home. The more you are aware of what your step-grandchildren are dealing with in their new life, the more understanding and resourceful you can be to help them get through it. Understand that you, too, may need time to adjust to new family situations and your own feelings. For example, you may not yet be comfortable with your child's choices that led to divorce and remarriage. You might even be a little upset that he or she married someone with children. Be honest with yourself. However upset or disappointed you may be, holding on to those sentiments puts your influence as a step-grandparent in serious jeopardy. Share your thoughts with someone you can trust who will be honest with you. It's understandable that you may be tempted to treat step-grandchildren unequally or differently. But what you do for your children's children, you should also do for your children's stepchildren. That includes gifts, attention, outings and any other investment — no differences and no favoritism. They're all equal in God's eyes. They should be in yours, too. Once you have a good grip on your feelings, you'll be better prepared to share your life with your step-grandchildren. Grandparent relationships have an enormous power, even over long distances, to give a "grand" kind of love to step-grandchildren. Grandparent relationships have an enormous power, even over long distances, to give a "grand" kind of love to step-grandchildren. If you can be Umpa or Mugga to your grandchildren, your step-grandkids can call you something unique as well. Give step-grandchildren the same chance to assign you a name. I remember when one of our little guys, who was about 4 at the time, said to his daddy, "How can he [referring to me] be my grandpa? My other grandpa is my grandpa." That makes sense, doesn't it? So our California bunch and our little fella in Michigan call us Grandpa Bob and Grandma Mary. To the ones in Ohio and Florida, we are Bobby and Mamie. We see this as precious expressions of their intimacy with us. 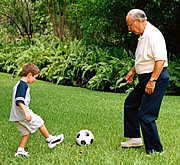 Grandparents have a unique position to step back and observe the needs of each step grandchild. Being better in tune with a child's individual personality will enable you to determine what approach will work in strengthening a relationship. Step-grandbabies are comparatively easy to form a bond with, but bigger kids can have difficulty adjusting to the dramatic changes in their lives. As a result, they may not want a relationship with you ... yet. Be willing to take it slowly. Let them have the time and space to respond to your willingness to love them on their terms and timetable, not yours. Don't give up on a somewhat distant child. Extend your love and attention without hesitation. It may be difficult, but if your intention is to have a substantive relationship, you'll see the value and be willing to wait. Watch for the signal from them that says, "Let's have a go at getting to know one another better." Then you know they're ready to lower their guard and let you into their lives. In the meantime, listen and spend time with your step grandchildren. Recognize their interests and the special events in their lives. Accept them, and look for ways to enhance their self-confidence. Tell them at every appropriate opportunity that they are special to you. The memories we have with our step-grandchildren have made us smile many times over the years. May the gifts you give your step-grandchildren bring you countless blessings as well. Focus on the Family magazine, June 2007. Article copyright © 2007, Robert Busha. and 11 step-grandchildren in Ohio.